The IBM Data Science Experience (DSX) platform now integrates Streaming Analytics services using version 1.6 of the Python Application API, which enables application development and monitoring entirely in Python. The currently supported Python version is Python 3.5. Create IBM Streams applications in DSX Jupyter notebooks. Create apps that are run in the Streaming Analytics service. Access data streams from views defined in any app that is running on the service. Furthermore, Python developers can now monitor submitted jobs with the Python REST API. This is particularly interesting for developers who want to retrieve and visualize streaming data in Jupyter notebooks, for example, for debugging or extra logging. To develop streaming applications with Python 3.5 in DSX Jupyter notebooks, you can use the STREAMING_ANALYTICS_SERVICE context to submit a Python application to the IBM Streaming Analytics service. Hello World! : Create a simple Hello World! application to get started and deploy this application to the Streaming Analytics service. Healthcare Demo: Create an application that ingests and analyzes streaming data from a feed, and then visualizes the data in the notebook. You finally submit this application to the Streaming Analytics service. Neural Net Demo: Create a sample data set, create a model for the sample data, use that model in a streaming application, visualize the streaming data, and finally submit the streaming application to the Streaming Analytics service. Use the Python API to compose the streaming application. Submit the application to be run in a Streaming Analytics service. Retrieve data back into the notebook for visualization. The purpose of the Neural Net notebook is to demonstrate how a data scientist can train a model on a set of data, and then immediately incorporate that model into a Streaming Application. For brevity, several imports and function definitions were removed, however the full code is shown in the notebook itself. 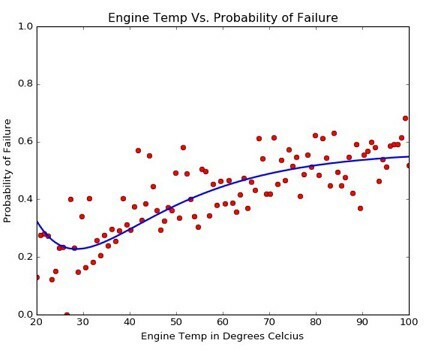 Given the data set we created, we use the PyBrain library to train a Feed Forward Neural Network (FFN) as a model to predict failure probabilities given a temperature. # The training harness. Used to train the model. # Display the model in the plot. The fully trained model, net, is a simple Python object, which, when provided with a temperature value, produces a probability reading. Above, we can see the output of the model (in blue) plotted against the data set. It isn’t enough to simply have the net model in the DSX notebook, we might want to send it into production to predict failures in real time. To insert the model into a real-time streaming application with the streamsx.topology Python API, you must use classes that create and manipulate streaming data. The following two classes represent such creation and manipulation of data, and are necessary components of the streaming application. The periodicSource class submits a random number between 20 and 100 every 0.1 seconds, and is used to simulate sample temperature readings. The NeuralNetModel class simply takes a data item, feeds it as input to the neural net, and returns the output onto a stream. # A class which runs the neural net on data it is passed. # OUTPUT: an array containing the output of the neural net, as well as the input to the neural net. 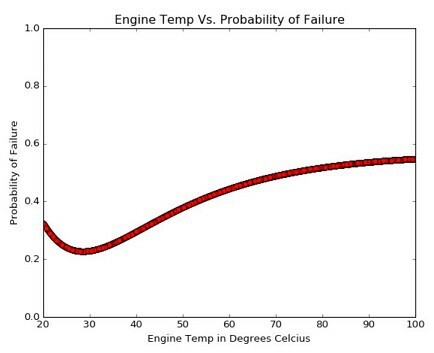 The Application uses the periodicSource class to generate a stream temperature readings, which are then processed by an instance of the NeuralNetModel class to create a stream of probability readings. Since we are interested in viewing these probability readings, we allow the stream to be viewable with the view() method. Now that we have defined the application, we submit it to be run on a Streaming Analytics service on Bluemix using a call to submit. You’ll notice that the credentials and service_name values are used to define a cfg object used for authentication. Both of these can be obtained from the Streaming Analytics service management page on Bluemix. Once the call to submit has completed successfully, the application is running. We can view its output in DSX using the view object that was created earlier. 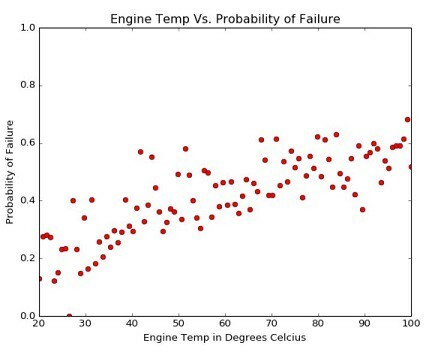 Each dot in the above graph represents a live temperature reading used to predict likelihood of failure. Every time a new temperature reading is sent through the model, its output is reflected in the graph. Data visualization is becoming an increasingly important part of data science. After creating a model, a data scientist needs immediate visual feedback on its effectiveness both in and out of a production environment. Whether with static or real-time data, DSX is a tool that helps developers achieve this. Originally published at datascience.ibm.com on May 4, 2017 by William Marshall.